Your road-sharing resolution can begin New Year’s Eve, when you decide how to bring in 2010. If you know you’ll be drinking, pocket those car keys and take transit or a cab. Think there’s no such thing as a free ride? TriMet offers free service New Year’s Eve after 8pm, and Yellow, Blue, and Green MAX lines run until 3am. RideOn Portland (503.235.RIDE) is also a useful service from a great nonprofit for those who find themselves drunk and with car. They’ll drive your car and you for a bargain $10 from SE Portland or a number of sponsoring bars. Then start 2010 off right by complying with the new cell phone. As you may have heard, on January 1st, 2010, Oregon’s new distracted driver law takes effect, which prohibits driving while dialing, texting, or talking on a cell phone, with fines starting at $90. While a person who is 18 years or older can use a hands-free device, studies have shown that hands-free provides the same mental distraction as holding a cell phone. Save the call for the destination. Here’s wishing everyone a happy, prosperous and SAFE New Year! Too good to ignore, “The Twelve Lanes of CRC” (to the tune of the 12 Days of Christmas), posted by Vancouver’s Todd Boulanger as a comment on a Bike Portland post. 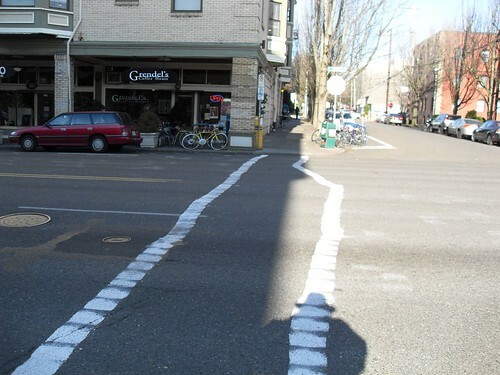 Some entrepreneur has painted their own crosswalk on E Burnside at 8th. It happened on or around Christmas, according to the reader who tipped us to this. 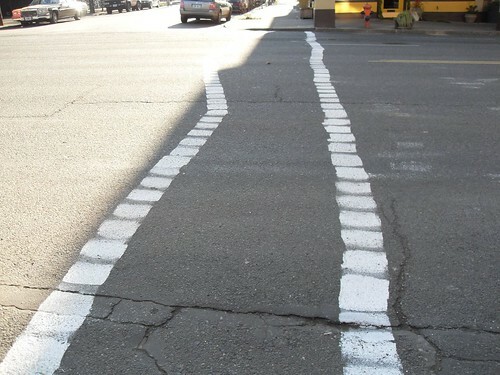 The straight-line-challenged person responsible has not stepped forward to take credit yet. Personally I did not feel any safer crossing the street there. Four lanes of fast-moving traffic is still four lanes of fast-moving traffic. Councilor Rex Burkholder – a 10-year Metro veteran and former chair of JPACT. Previously he founded the Bicycle Transportation Alliance. Bob Stacey – most recently Executive Director of 1000 Friends of Oregon, he has also served as Portland’s Planning Director and in Congressman Blumenaur’s DC office. The winner of this race will have significant influence on transportation policy in the region, possibly for many years to come. While Portland Transport as a non-profit cannot endorse candidates, we can help educate voters. I propose that Portland Transport create a questionnaire on transportation policy for this race and publish the responses. What should we ask? Be specific! Transportation for America is hiring a field organizer for Oregon. The position will be hosted at 1000 Friends of Oregon. Convene and provide staff support for a diverse coalition of partners and allies. Provide assistance with local education and outreach efforts of Oregon groups. Develop educational tools and materials on campaign goals and issues (in coordination with other local coalition partners and other T4America campaign teams). Engage in policy advocacy, media outreach and organizing public events. Support and strengthen creative partnerships and grassroots transportation reform campaigns in Portland, Eugene and other Oregon cities. campaign, including local business leaders, environmental organizations, labor unions, the real estate sector, equity and health groups, elected officials and others. Expand the capacity of local and state campaign partners to engage with state and federal leaders on transportation and other related policies. Analyze and translate federal policy goals and “best practices” in transportation reform into a Oregon-specific context through outreach to local groups and allies. Unless some breaking news comes along, this will be my final pre-holiday post, so I’d like to take this opportunity to extend wishes to all our readers for a joyous and safe holiday season!